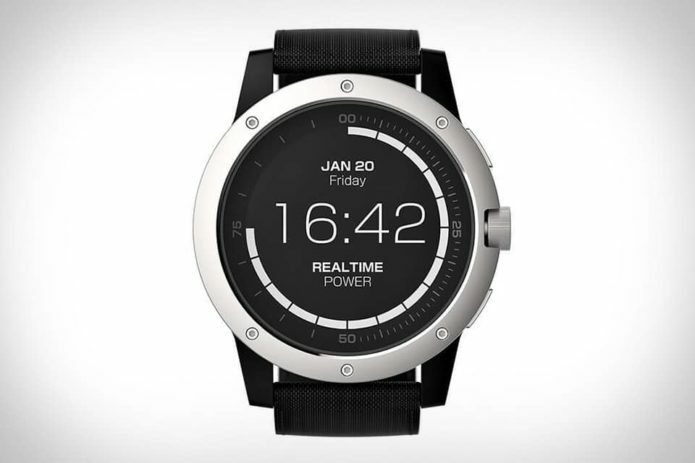 The PowerWatch is a smartwatch from Matrix that stores your body heat as battery power, and so never needs to be charged. It has a 240 x 240-resolution reflective monochrome display, and a large plastic and aluminium casing. It doesn’t show notifications, so its smart features are limited to step, calories and sleep tracking. There’s no GPS or heart-rate monitoring, but the watch does have a “Running Mode” that functions as an independent step counter. Matrix tells us the PowerWatch costs £200 direct from its site or from Selfridges, but currently, we can’t see any listings in UK currency. In terms of features, its main competition comes from fitness wearables like the Fitbit Flex 2 and Fitbit Charge 2, both of which cost considerably less. The Charge 2 does everything the PowerWatch can do in terms of tracking steps, calories and sleep, and its battery lasts five days between charges. You also get the bonus of heart-rate tracking. If you want GPS, Garmin’s Vivosport represents one of the best-value options at £130, although its small screen can be a little fiddly. At 46mm across and 15.5mm thick, the PowerWatch is really quite chunky. It has a part-plastic, part-aluminum body, which sadly doesn’t look quite as attractive in reality as it does in its promotional material. Unfortunately there’s no touchscreen, either, so you navigate its menus using two buttons and a crown. Frustratingly, despite its heft, the watch doesn’t look or feel as robust as you’d like either. In particular, the buttons feel a bit cheap – in the photo above you can see that there are sizeable gaps around them, and one is also imperfectly aligned. One pleasant surprise was that the watch isn’t as heavy as it looks. It’s listed as 50-60g on the website, which is lighter than the similarly chunky 62g Samsung Gear S3. It’s also deceptively comfortable, once you’ve got over the initial struggle with doing up its stiff nylon strap. I had no issues wearing it all day long, and even when I left it on at night, I wasn’t especially aware of it. The PowerWatch has a 240 x 240 reflective monochrome display, which ought to be the perfect choice for a low-energy device like this. After all, such displays are always-on, visible in all light and highly energy-efficient. Although these points are all true, unfortunately the watch face’s hardened plastic lets it down a bit – it picks up a lot of fingerprints, which quickly become smeary, and its curved surface reflects a lot of glare from overhead lighting. There’s a backlight for using in the dark, but you can only use it up to four times an hour so as not to exceed the specified energy quota. The light is so underpowered that it only just provides enough light to check the time in a pitch-black room. That’s a good thing if you want to check the time without a flood of blue light hitting your eyes, but in most situations it’s almost useless. The PowerWatch’s main feature is its thermoelectric generator. Whenever there’s a difference in temperature between your skin and the watch’s casing, it’s generating energy. A cursory glance down at the device tells you both these temperatures, and the greater the difference between the numbers, the more energy you’re generating. The amount of energy you’re generating at any time is displayed using a “real-time power” gauge around the outside of the watch face, which you can check by twisting the crown. In the event that you take the watch off your wrist, it still won’t run out of battery: after 45 minutes, it will automatically enter Power Save mode and turn off the screen. If fully charged, Matrix claims it can remain in this state for one year or more. Sadly, the PowerWatch doesn’t show notifications on your wrist but this feature will be included on the forthcoming PowerWatch X, which is available from May. However, the PowerWatch X is both larger and more expensive than the original PowerWatch. Pressing the Mode button once will load the PowerWatch’s Daily Activity menu. Here, you can see your total step count and distance covered, along with the number of calories you’ve burned. Unlike other wearables, the latter is calculated using not only your activity data but also the temperature data gathered by the PowerWatch. Matrix claims this is “inherently more accurate than fitness monitors that calculate calories based on step counting or other activity-based approaches”, but since we have no way of empirically testing this, we’ll have to take them at their word. Twisting the crown in this mode also shows a summary of your sleeping data. Although the website’s promotional shots show this screen with details of deep and light sleep, I was disappointed to find that the model we were sent showed only the total amount of sleep. Unlike many fitness trackers, the feature isn’t automatically enabled, either. You need to press the Set button for three seconds to enter sleep-tracking mode, and the PowerWatch detects when you’re no longer sleeping, and makes a record your total sleep duration. I suppose it’s handy to have the process partly automated and synced to an app, but the watch really doesn’t tell you much that you couldn’t estimate for yourself. In terms of live sports tracking, there’s only a “Running mode”, which works as an independent step, distance and calorie counter accompanied by a timer. There’s a pace reading, but since there’s no GPS and the watch won’t even pair with your phone, this is calculated using its accelerometers and algorithm alone. The PowerWatch is waterproof to 50m, so you’ll have no problems jumping straight in the shower or pool after a workout, but sadly it doesn’t count lengths or strokes. To build a long-term picture of your overall activity levels, the PowerWatch needs to be synced with the PowerWatch phone app to log step, distance, calorie and sleep data. To do this, you simply open the watch’s settings menu and press Set to initiate a sync. Matrix recommends doing this only a few times a week, not least because it drains the battery, but also because the watch can store up to seven days of data at a time. It’s impossible not to be intrigued by the technology in the PowerWatch. After all, how many other smartwatches can you say will never need to be charged? However, even with the lowered expectations that come with knowing it charges from body heat alone, the PowerWatch is still just a little bit disappointing. There’s no GPS and no heart-rate tracking, both of which are available from Garmin’s Vivosport. In fact, the Vivosport is smaller, cheaper, and still lasts five or more days between charges. Practically any fitness wearable with a screen nowadays (and indeed some without) can also provide some kind of notification alerts. That’s not to say the technology isn’t exciting: it absolutely is. 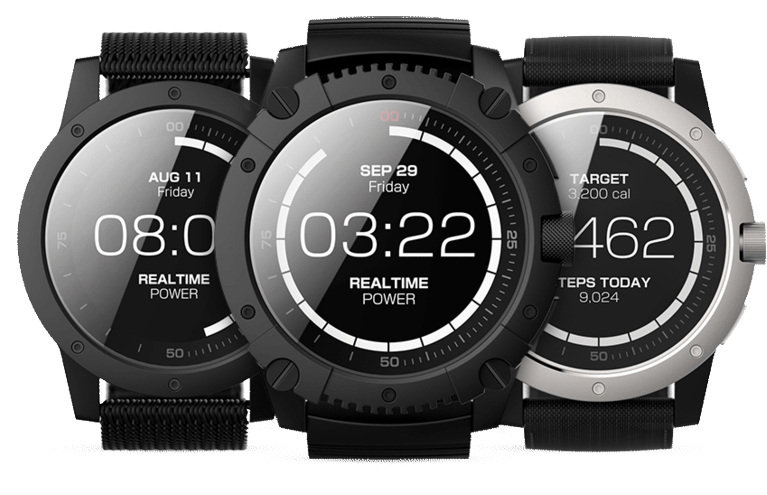 It’s just that we’re already making great progress with power-efficiency and battery technology, and it’s hard to see how Matrix’s PowerWatch can match those smaller, more feature-rich competitors.